Level Up! Last Week In Review | Handful of Health | Health, Fitness and Happiness, one handful at a time. I leveled up twice last week! On Friday I was awarded a stripe on my jiu jitsu blue belt, and on Saturday we completed our black belt pre-test. The pre-test is kind of cool because you get to flip your belt upside-down, so rather than being red on top and black on the bottom, it’s black on top and red on the bottom — symbolizing that at this point in our test, we are closer to our black belts than our previous belts. The pre-test was interesting in that we essentially did it twice. Saturday’s event was honorary to some extent, because Tres sprung a surprise pre-test on us at our usual special training workout the week prior, on the morning after the beach workout. So, in addition to being asked to perform at our best with no advanced warning, we were also all fatigued from the previous day’s training. While this felt rather cruel at 7am that day, as we warmed up with sprint intervals on calves and shins still tight from sand relays on the beach, the surprise pre-test was well designed. Our final test — The Test, if you will — is a two-day event at the end of September. So, in just two months we’ll be asked to perform at our best while fatigued in a similar fashion. It was eye-opening for me to discover, yet again, how these past few months of training have paid off. I know I say something like that in practically every single weekly journal, but I honestly do surprise myself nearly every week! For any other test, I would have gone through my entire curriculum for memorization purposes for a few days leading up to the event just to make sure that I didn’t space out and completely forget a form or a kick combo or one of our self defense techniques. On the day of the surprise test, I hadn’t really gone through combos, kicks or forms for at least a week, maybe longer. (Forms on the beach didn’t count; I was having a hard enough time keeping my balance while blindfolded that day to consider it drilling!) Yet I managed to not only pull it together for the surprise test, I was able to pull it together with the kind of intensity and explosive power that I’ve been trying to cultivate. One thing that I got to do at the official pre-test that I didn’t do at the surprise pre-test was more live grappling rounds. It felt good to really go for it in my rounds. That’s something I don’t always do in class, when I’m trying to practice what we drilled that day and give my partner opportunities to practice, too. Even though I wasn’t able to lock down any submissions, I was pleased with my ability to improve my position to the point where I could at least threaten various attacks, keeping the rounds interesting. I was also able to integrate some of what we’ve been drilling with Scott all summer into the live rounds, which always feels good! My goal for this week is to dial in my conditioning, since our first conditioning test, pull-ups, is coming up in just ten days. Additionally, I’m going to re-commit to my daily mindfulness meditation practice. I don’t recall when or why I stopped, but I’ve noticed a marked decrease in my ability to focus and a marked increase in my overall anxiety since then. Thank you all for your support this week. I really needed it, and I got it in spades from so many wonderful (and occasionally surprising) sources! This entry was posted in Goals, Martial Arts and tagged belt testing, bjj, black belt journal, gifs, intention2015. Bookmark the permalink. In the moving GIF above, there are ninja masters in the background and what looks like a 12-year old? Is that the modern-day Ernie Reyes Jr of your gym? OMG, I didn’t see your comments until just now! Yeah, at the pre-test, our instructors all sit behind a table in front so they can ಠ_ಠ at us the whole time. 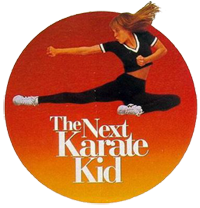 There are only like maybe six adult black belt testers this year out of 20-something candidates… but no that’s not a 12-year-old behind me, I think she’s even younger! Haha.